BROOKHAVEN, Miss. 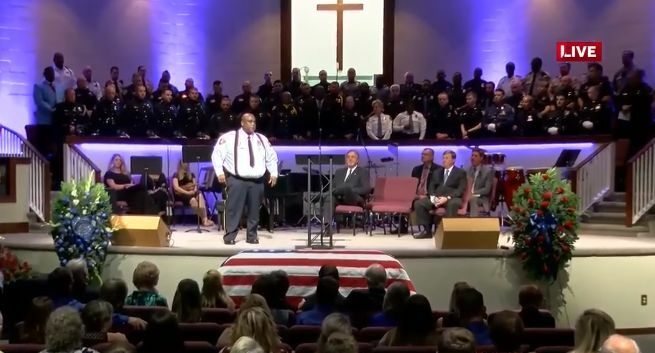 — A Mississippi police chief boldly declared the word of God on Thursday and referred to those in law enforcement as the army of God against evil as he spoke at the funeral of a fallen police officer. “How awesome is God,” Brookhaven Police Chief Kenneth Collins declared at Easthaven Baptist Church, as he paid tribute to Cpl. Zach Moak, 31, who was killed on Saturday along with Officer James White, 35, as they responded to a call of shots fired after 4:30 a.m. Saturday morning. White arrived on the scene first, followed by Moak. The suspect, Marquis Flowers, 25, reportedly engaged in a shootout with the officers, striking both of them. Even though he had been wounded by gunfire himself, Moak grabbed White and sought to pull him to safety, sacrificing his own life in the process. He then addressed the many law enforcement officers who had come to honor a fallen comrade, reminding them that while they put their life on the line on a daily basis, they do not do so simply to fulfill an employment requirement. They have a higher calling. Collins asked all law enforcement officers, along with district attorneys, jailers and judges, to stand to their feet. He said that he wanted to show the family the support that they had from others. He then promised the family that those present will carry on the fight in Moak’s absence. “All you criminals, all you social media folks, you want to talk about us? This is God’s army, and no weapon formed against us will ever win,” Collins declared, quoting in part from Isaiah 54:17. The chief’s remarks were met with applause and affirmation. View them below.